Description: Time; the present. At a lavish party thrown by an unknown host, a young lady, Linda, meets a handsome Texan and tries to discover who and where the mystery host is. Exploring the house, they happen upon a room that unexpectedly turns into a projection room. The film that the two guests watch is a very old �stag reel� of a very old man seducing a middle-aged woman. Later beside the pool Linda meets the mysterious host, Darrin Blue. Through a series of flashbacks Darrin explains that the old man in the film is in fact, Darrin Blue. �Take Off� is a delightful update of the Oscar Wilde idea of a man who never ages; but in this case, his image on an 8mm film ages instead. 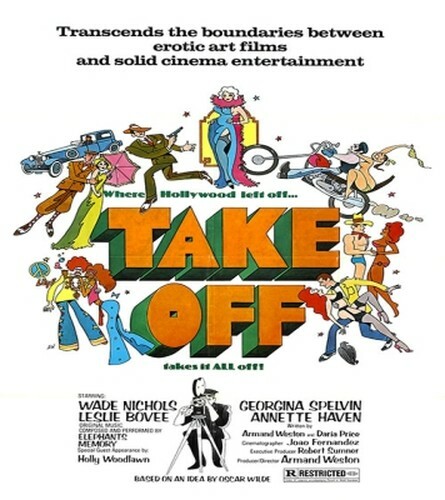 But �Take Off� is also quite literally, a take off on the movies of the 1930’s, 40’s, 50’s and 60’s. Darrin Blue in those time periods actually becomes some of our favorite characters from movies we all remember.